Rotisserie Chickens: Deal or No Deal? Is a Rotisserie Chicken Actually a Smart Budget Dinner? Their mouthwatering smell hits you as soon as you’re within 20 feet of the deli section, outdone only by the sight of their delectable, crispy skins. They’re the undeniable MVP of quick, cheap dinner options that are still healthy and delicious. Heck, I grab one almost every week — I mean, what puts you in less of a mood to cook dinner than hauling in all the bags after a grocery shopping trip? But have you ever wondered why those rotisserie chickens are such a sweet deal? In most stores, they cost about the same — or even less! — than fresh, whole raw chickens in the meat case. And the work’s already done for you! Karin Klein took matters into her own hands and tackled this apparent conundrum, hitting stores and talking to experts to figure out the elusive answer to The Chicken Question. After all, the cost of rotisserie chicken “seems like an unbelievable bargain,” as she writes in her piece at Priceonomics. But as Klein discovered, not everything is always as it seems. Yes, rotisserie chickens are often cheaper than their raw counterparts… but it’s not because they’re about to expire. Nor, in most cases, do the chickens act as loss leaders — appealing, intentionally underpriced goods intended to get customers to spend more elsewhere in the store. So although it seems like the chickens are the same price, you’re actually paying more for the ready-made rotisserie, pound for pound. Fortunately for the store, however, this size difference is usually invisible to the consumer — especially one who’s hungry and pressed for time. Plus, since the smaller, rotisserie-bound birds come ready-to-cook from a separate producer than the fresh ones — and are usually pre-seasoned and “pre-injected” with additives like water, salt and carrageenan — the store doesn’t have to do much work to get them ready to sell. Are Rotisserie Chickens Worth It? Klein ran a price comparison to see how much money you’d save, per pound, by ditching the pre-made bird for a fresh one cooked at home. She pitted rotisserie chickens against fresh ones from seven different California marketplaces, remembering to factor in loss of volume and the price of the oil and modest seasonings she used in cooking. She even included the cost of heating up the oven and cleanup afterwards. In the remaining two markets, the chickens were intended as loss leaders — but they were still almost the same price as fresh, saving consumers less than 20 cents per pound. Considering the final product’s usually three pounds or less anyway, you’re looking at a total savings of about $6, tops — certainly nothing extravagant. 1. Season chicken with salt, pepper and whatever else seems palatable at the time. 2. Put chicken in 350-degree oven on a cast-iron skillet or roasting rack. Of course, it’s hard to argue with the convenience of a rotisserie chicken when you remember you have nothing planned for dinner just as you’re getting ready to leave work at 4:57 on a Thursday afternoon. Should You Buy Rotisserie Chickens? For many of us, be we lazy, busy or simply uninterested in running a hot oven during a sweltering Florida summer, rotisserie chickens will continue to be a worthy splurge, subpar size not withstanding. Besides: I don’t know what they put in that “mojo” rub at Publix, but that’s one flavor I cannot recreate at home. 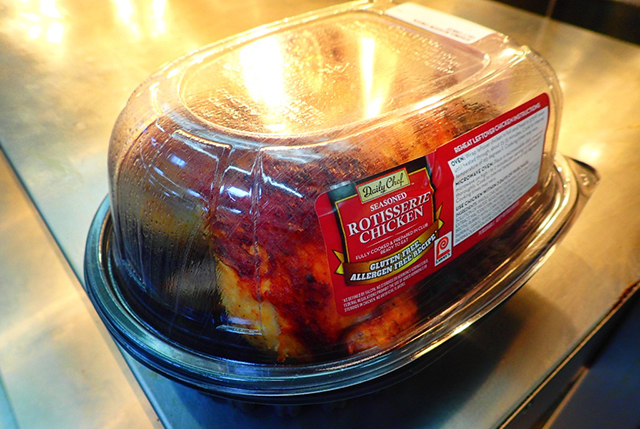 Your Turn: How many nights a week do you pick up a pre-made rotisserie chicken for a quick and easy dinner? Jamie Cattanach is a staff writer at The Penny Hoarder and a frequent, enthusiastic eater of rotisserie chickens. Her writing has also been featured at The Write Life, Word Riot, Nashville Review and elsewhere. Find @JamieCattanach on Twitter to wave hello.